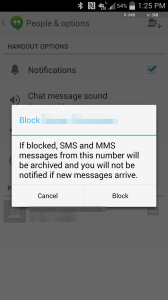 Hangout is being updated from 2.1.100 to 2.1.223, the app that is used to receive and send messages can now block a particular or individual contact and you will stop receiving the SMS and MMS from that number. 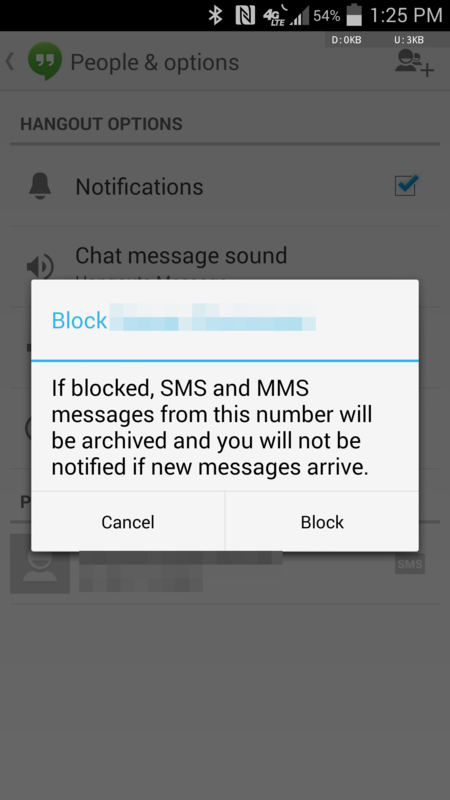 This saves time as well as energy and keeps you far from all the annoying SMS that you will be receiving. 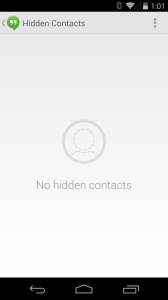 This blocking is not a new feature but you will be getting a list of all the blocked contacts making it easier to know who has been blocked and you can also unblock them if you want in the future. Apart from this list there are few other improvements and tweaks. You can now set a custom notification tones for each contact, so that you can easily know from whom you have received the message. With this update you can now send Group hangouts by saying “Send to Group” instead of saying “Send Hangouts”. You get a new keyboard indicator button to switch between the numpad and full keyboard layout. The hidden contact list is also being updated. These features are already available on many third party applications so this is a good update to Hangouts. 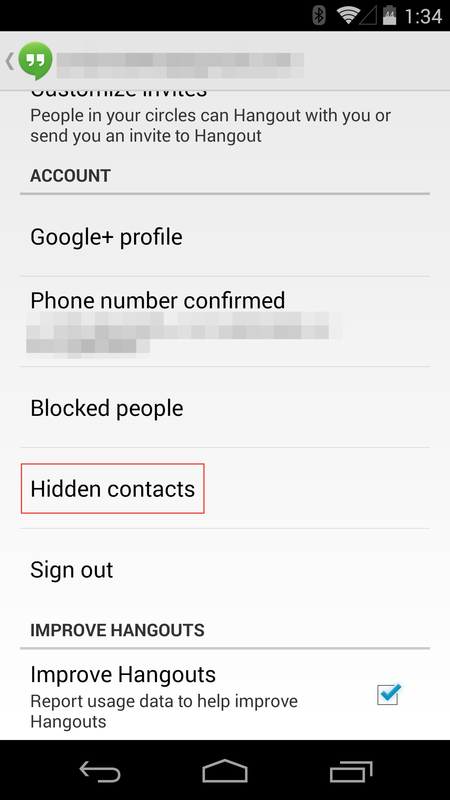 The Hidden cont will let you hide a hangout contact and that contact will go to the hidden contact list and will be erased from the main conversation list. You can hide the contact just by long pressing the Hangout contact and sect the Hide contact option. 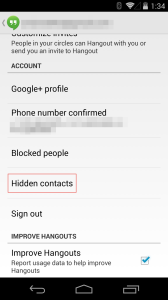 From the hidden contact list you can restore the contact whenever you want. You can download the APK file or wait for it to be pushed to your device. Google Hangouts has been updated with new version that will now merge your conversations and will make Hangouts easier to use with some new features. A post on the Google+ gave all the change logs that are coming with this new version (Version number 2.1). According to the change logs, you can merge your SMS and Hangout conversation with the same person so that you need not switch to SMS and Hangouts every time. You just need to flip of the switch and you can find different messages types that are easy to differentiate. If you want to keep the SMS and Hangouts separate, you can unmerge them too. You have the option of selecting a presence status, showing your moods and other modes. Another important thing is the new notification sound that lets you know about the new message you receive. This new version also gives you the option of Separate voice and video call tones and also highlighted outgoing handout messages that will make it easier to use while merged. 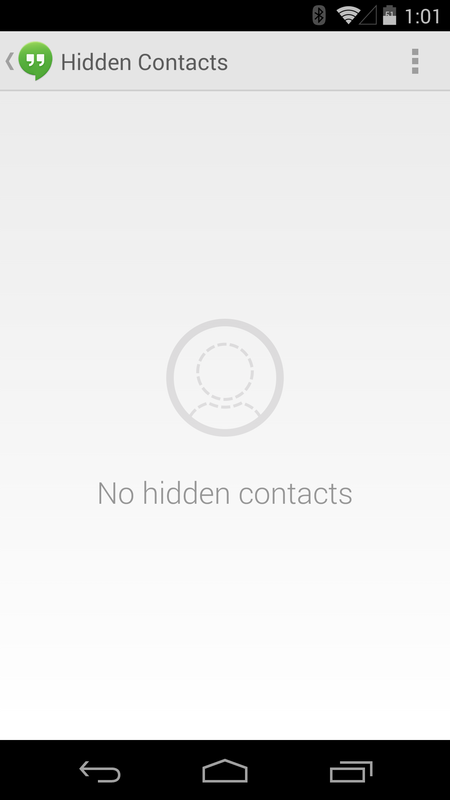 The update also bring a easier to navigate option from your contacts as you can create two different sections in contacts, as one you Hangout with and the other for Phone Contacts. We can also see improvement in the performance as the update brings better quality video calls and also improved SMS and MMS reliability for its users. With this new version add all your Hangout widgets directly to your home screen for easier and quick accesses to all your recent conversations. To save media you just need to long press on the images and view it later if you want. 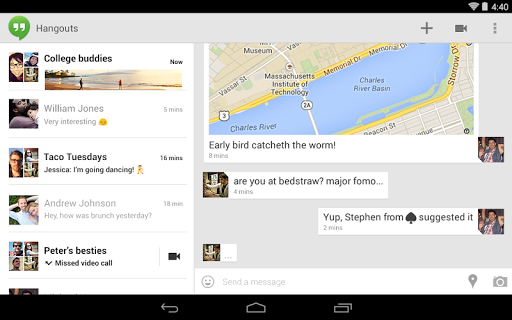 All these features will definitely make the use of Hangouts easier and reliable. The APK is signed by Google and will be updating your existing app, this cryptographic signature from Google will make sure that the file is safe to install without any tampering. If you are eager to have this new version just download and install this APK file or you can still wait till Google rolls it officially. My nexus 5 is already have the Hangouts version 2.1.224. How come this update?